A well-roasted duck breast offers your palate a remarkably appealing combination of flavors and textures. 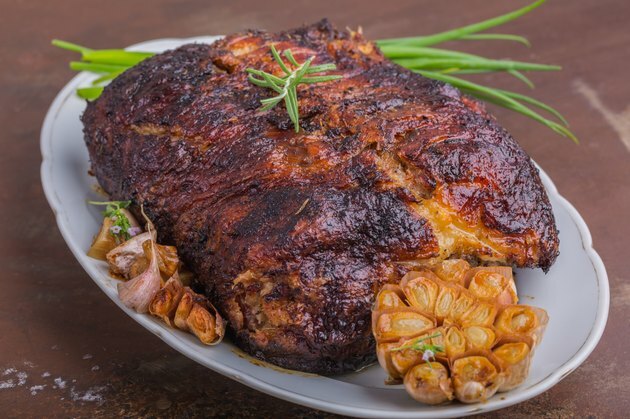 The meat itself is dark, lean and flavorful, while the golden skin provides a crisp and richer complement. The net result -- an alluring contrast of fat and lean -- is akin to a bacon-wrapped piece of beef tenderloin. The crucial step in this process is rendering out the layer of thick fat that rests between the skin and breast -- before it's oven-cooked. Use the tip of a sharp knife to remove the small tendon from the underside of the breast, then peel away the thin sheath of gray-white connective tissue, or "silverskin," that's visible over part of the breast meat. Blot the breast dry with clean paper towels, and sprinkle the skin side with coarse salt. Refrigerate the breast, uncovered, for six hours or overnight. This step is optional, but helps produce an appealingly crisp and golden crust. Brush off the coarse salt. Using a sharp knife, cross-hatch the skin with a series of shallow cuts. Take care to cut only the skin, not the breast underneath. Place the duck breast skin-side down in a heavy skillet. Bring the pan to medium heat and brown the breast for six to eight minutes, spooning off the fat as it accumulates. When the skin has browned thoroughly and the fat begins to render more slowly, remove your skillet from the stove. Blot any melted fat from the surface of the breast, and season it to taste. Transfer the breast to a roasting pan with a rack, and slide it into the hot oven. Depending on the size of the breasts, they'll reach medium-rare -- 135 F -- in six to 10 minutes. Remove the duck from the oven and let it rest for at least five minutes before slicing and serving. The duck breasts you'll find in most stores are from young, tender ducklings, and typically weight 5 to 6 ounces. If you have the good fortune to find larger French-style breasts, described as "moulard" or "magret" on their packaging, these can weigh a pound or more and serve two to four diners. They're cooked the same way, but your roasting time will approximately double. Roasting your breast on a rack allows the remaining fat to drop from the duck as it cooks, rather than leaving the breast to swim in fat at the bottom of the pan.